Skating was a big part of my childhood. No, I didn’t make it to the Olympic trials or anything like that. But as a child, I spent most Saturdays at our local rink playing the number game and the Hokey Pokey. As a teen, I spent many weekend evenings there, sporting my pink silk jacket (anybody else?) and hoping someone would invite me to the couples skate. Sure, the world has changed a lot since those days but kids are kids. Trust me. Skating is a great way to get kids (of almost any age) active and away from their phones, laptops, tablets, etc for a few hours. Moms and dads can join in the fun too. I know you’ve still got those moves you perfected in the 80’s and 90’s. So lace up those skates and hit the rink with your kids. Or get a babysitter and plan a retro date night! 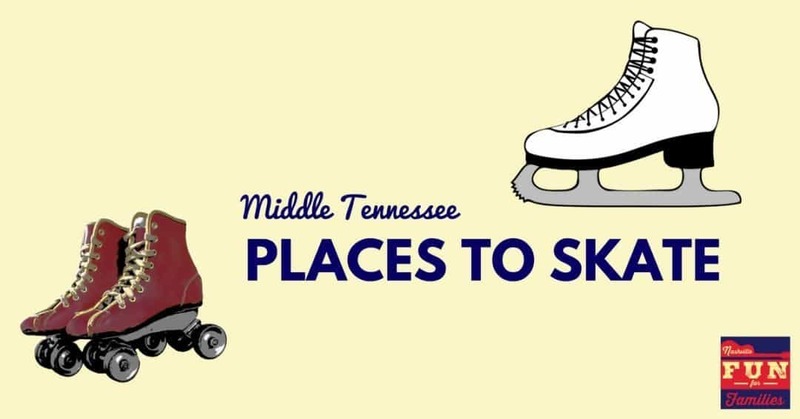 Whether you prefer ice skating or roller skating, you can find plenty of places to do both in Nashville and Middle Tennessee. Family and open skate times offered throughout the week. Schedule at this link. Family and open skate times on Tuesday, Thursday, Friday, Saturday & Sunday. Hours at this link. Family and open skate times Thursday – Sunday. Hours at this link. Family and open skate times Tuesday, Friday, Saturday & Sunday. Hours at this link. Admission i $4 – $8 depending on session. Skate rental is $2 for regular skates and $3 for speed or inline skates. Skate Center West participates in the Kids Skate Free program. Details at this link. Roller skating is available in Circus World during any open hours. Admission is $3.95 on weekdays and $5.25 on weekends. Skate rental is $2. Skating is also included with the daily wristband promotion that includes unlimited activities. Wristband price varies depending on date/time. Roller Skating is available during open Fun Center hours. Admission is $5 Skate rental is $3 and skate trainers are $2 Skating is also included with the daily wristband promotion that includes unlimited activities. Wristband price varies depending on date/time. 2 full size ice rinks for year round indoor ice skating. Public skating schedules can be found at this link. Daily public skate sessions available year round. Rinks are indoors. Ford Ice Center is also home to the Scott Hamilton Skating Academy. Information on classes at this link. *All times/prices and schedules listed here are subject to change. Check with your desired location to confirm.